Our curriculum is structured around a 30 minute lesson which includes warm up, simple aerobics, stretches, cool down and fun activities which are all designed to help the development of your child. We also include a short discussion on a different health related topic each week. All this is executed using really fun music, props and themes that link into the children’s imagination and interests. Children do not just ‘develop’ fundamental motor skills with age, they need instruction, practice and encouragement to develop these basic skills. Stretch-n-Grow can provide children with the activity, direction and encouragement required to develop to their full potential. We teach children that exercise is fun, but more than that, it is a complete health programme, which is aimed at encouraging the habits of a lifetime. All of this links strongly with the EYFS. It is basically active learning! Our instructors are all fully qualified in Early Years Physical Development and understand that there is a direct link between physical development and cognitive development. 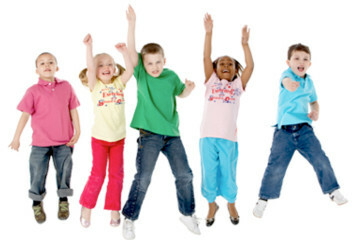 Movement is often defined as a child’s first language. It is through movement that a child first starts to explore the world and gain control of their body and it is the beginning of becoming an independent being, which is why we teach children from as young as 18mths at Archfield House Nursery. With this in mind, every session is planned with in-depth knowledge of movement development and the fundamental skills explored in the lessons link to the age related milestones that help promote development. At Archfield House we teach 3 sessions on Wednesday morning, so that children from the age of 18mths until school age can experience the excitement of stretch-n-grow. It is so rewarding to watch these children progress and develop on a weekly basis! There are also various opportunities for parents to experience Stretch and Grow for themselves as part of our Saturday Play Day Events.